Five graduating students who have been working at the AUS Library for the past four or more semesters were recently honored through the AUS Library Student Assistant Recognition Program and recognized for their commitment and hard work as student assistants. 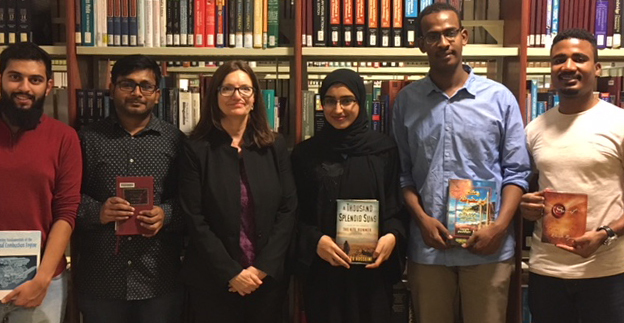 Graduating students Shadia Abdalla Salum, Mohammed Shahrook Shahid, Waleed Qureshi, Hamza Ahmed Badawy, and Alhassan Hamad were asked to select a book of their choice which was then inscribed with a personalized bookplate in recognition of their work. The students put a great deal of thought when making their personal book selections as these books are a reflection of themselves, as well as lasting tokens of their service at the library and time as AUS students. The AUS Library employs 35 student assistants who work on part-time basis during the days, in the evenings and on weekends to ensure that it continues to provide high levels of service to all the campus community.